Cruising Companion Pawprint Hammock Car Seat Covers provide comfort for pets, and cleanliness and convenience for their owners. 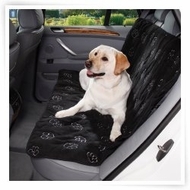 Cruising Companion Pawprint Hammock Car Seat Cover gives pets gentle cushioning for a pleasant ride. Featuring our popular pawprint design. Hammock-style design keeps pets comfortably contained in the back seat. Comes with seat belt holes to allow for a secure fitting. Machine wash in cold water on gentle cycle. Lay flat to dry. 100% Polyester. Place cover on rear seat so that the end marked "T" on the back covers the top of the seat. The end marked "B" should cover the bottom. Connect the top straps and loop them over the seat’s headrest. Adjust the straps for a secure fit. Repeat this step for both the front seats and back seats so that it is attached to all four headrests. If using a safety harness with a seat belt attachment, thread the seat belt through the hole in the cover.